Are you a business owner in Sicily? Promote your business 365 days a year with the #1 Guide to Sicily. Ristorante Osteria dei Sapori Perduti has been serving its customers since 2006. 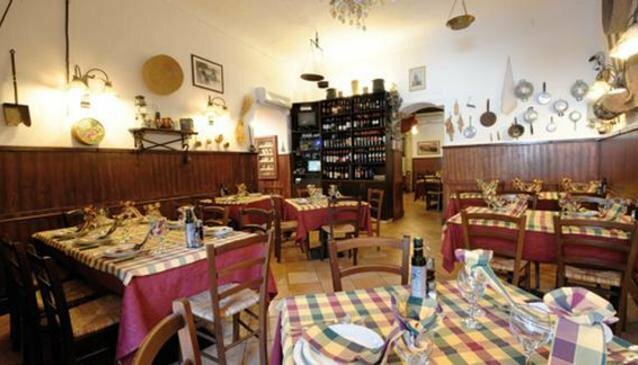 It has gained a respectable reputation by the locals and in 2009 was nominated for the Italian Hospitality Award in the category of Traditional Restaurants. Warm welcome and attentive service are the orders of the day in here. It has a very cosy interior with 3 very spacious dinning rooms where each room is decorated with soft tones and has a unique decor. The menu is fabulous and very unusually presented. Some guests describe it as almost a book as every dish is illustrated with pictures and a detailed description of what ingredients had been used and what cooking techniques were performed. Have a taste of the lentil soup or go for pasta with asparagus. If you want a meaty dish, Spezzantino comes highly recommended. Antonio is behind the extensive wine list boasting a number of reassuringly familiar names.